Please contact Dr. Macauley for more information. If interested, please provide a copy of your CV and, for undergrad and incoming grad students, a copy of your transcripts. 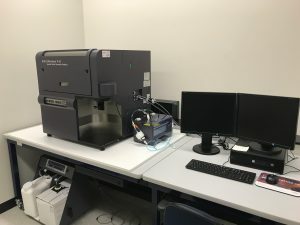 Jan, 2019 – See a Press Release from Glyconet (here) and UAlberta Faculty of science (here) about our recent success in a CIHR grant competition. September, 2018 – Our new toy arrives. 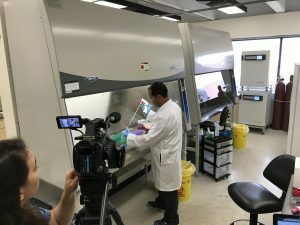 August, 2018 – JoVE filming for our article on antigenic liposomes to create a new mouse model of allergies. January, 2018 – Press release about a GlycoNet grant awarded to Dr. Macauley and Dr. Klassen. September, 2017 – NIH grant is awarded to our lab to study the role for glycans in coordinating the Germinal Centre. Feb, 2019 – Jhon receives an Alberta Innovates Graduate Scholarship – congrats Jhon! Jan, 2019 – Mirjam Anhalt joins the lab as a Master’s student, coming from Berlin for an 8 month stay. Dec, 2018 – Jhon Enteria receives a graduate scholarship – congrats Jhon! Nov, 2018 – Emily Rodrigues gets a travel award to present her work at the Society for Glycobiology annual symposium in New Orleans. Sept, 2018 – Emily Rodrigues receives a graduate scholarship – congrats Emily! Sept, 2018 – Kelli McCord joins the lab as a PhD student. Sept, 2018 – Jhon Ralf Enterina joins the lab as a PhD student. Sept, 2018 – Levon Movsisian joins the lab as a Postdoctoral Fellow. Aug, 2018 – Ayk Wadlow joins the lab as a Master’s student, coming from Berlin for an 8 month stay. Aug, 2018 – Gour Dakhan joins the lab as a Postdoctoral Fellow. May, 2018 – Emily R. gets invited to present her work in an oral presentation at the CSC in Edmonton. May, 2018 – Emily R. and Jaesoo present their projects at the GlycoNet Symposium and Sialoglyco in Banff. May, 2018 – Undergraduate Caleb Lobo receives a GlycoNet Summer Scholarship to work in the lab. April, 2018 – Fahima Mozaneh and Toni Dimaano successfully complete 3rd and 4th year research projects, respectively, with oral presentations. April, 2018 – Dr. Abhishek Bhattacherjee joins the lab as a Postdoctoral Fellow. January, 2018 – Susmita Sarkar joins the lab as a Research Technician. November, 2017 – Dr. Dharmendra Raghuwanshi joins the lab as a Postdoctoral Fellow. September, 2017 – Emily Rodrigues and Jaesoo Jung join the lab as PhD and Master’s students, respectively.